Earn the (Almost) World Famous NK50k Finisher Sticker! Join us for a point-to-point tour of the Northern Kettle Moraine Ice Age Trail! It's time to welcome Spring to the Northern Kettle Trail Running Community ... which means it will most likely be snowing! At 7:00 AM, we will start at the southern end, the Highway H Trailhead. Transportation will be provided to the start from the finish (Glenbeulah Trailhead), leaving at 6:15 AM. After we're done, we'll enjoy some burgers, refreshments, and PRIZES at Fudgienuckles. 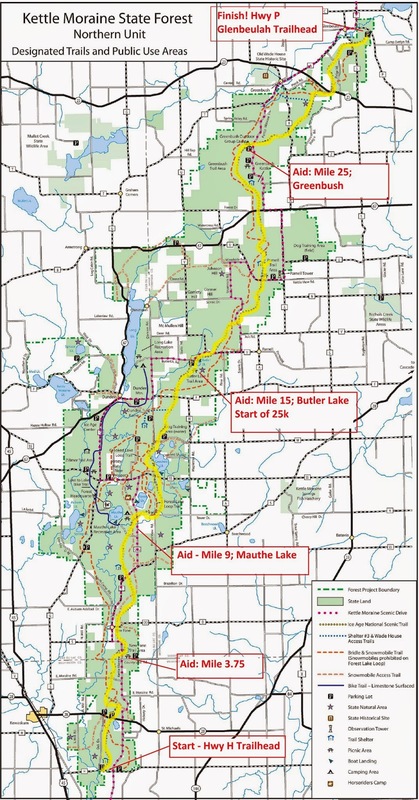 There will also be a 25k option that will start at Butler Lake. Again, this run will be Point-to-Point, finishing at the Glenbeulah Trailhead Parking Lot. The 25k will start from Butler Lake. This stop is also where Aid will be provided to the 50k runners. See the map below for details. Aid and access to drop bags for the 50k runners will also be provided at Mile 3.5 and at Mile 25. There is water available along the course at additional spots as well, at or near the backcountry shelters. 5:30-6:15 - Check-in. We are requesting a $10 contribution to cover expenses. 6:15 AM - The BUS will be leaving from the Glenbeulah Trailhead to take runners to the start at Hwy H.
9:30 AM - The 25k runners will be picked up at the Glenbeulah Trailhead (the finish), and taken to their start at Butler Lake. 10:00 AM - The 25K runners will take off! Enjoy! 11:15-? - Welcome back to Glenbeulah! Congrats on a great morning in the Northern Kettles! Now, off to celebrate! Aid Stations will include Water, Sports Drink, Coke, Mt. Dew, S!Caps, and assorted normal "Ultra Aid Station" foods. And Finally...REMEMBER: This is a fun run. The best effort will be made to provide aid as scheduled and at those locations, but stuff happens, so go in to this run assuming you're on your own! No Whining! From smooth and rolling ski trails, to the rocky and rooty Ice Age Trail, to the highest point in the Northern Kettle Moraine State Forest, the Greenbush area trails have it all!